Name A Star Gifts: Which One to Choose? Are you wondering which star gift would be suitable for you? The table below gives you a quick overview of the differences between the Online Star Register gifts. Click on the gift images or scroll down to find out more about each gift in detail. The OSR Gift Pack is a physical gift pack that is sent via post to the address of your choice. After you have completed an order, you can view the star in 3D right away in your browser, or look it up with the mobile OSR Star Finder app. You can also instantly download the gift pack contents in PDF format from your OSR account and view/personalize the unique Star Page. The OSR Gift Pack is our most popular gift! Order the OSR Gift Pack! After ordering an OSR Gift Pack you can also order an Extra OSR Gift Pack from your OSR account for the same star registration ($21/€15). Need a last-minute gift? 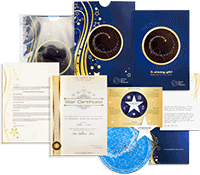 Or maybe you want to name a star in the Online Star Register without the costs associated with the gift pack? 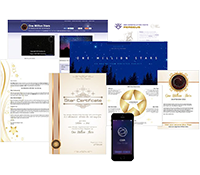 The Online Star Gift is a fully personalized digital gift that is instantly delivered to you. Discover the features of the Online Star Gift: our fully digital gift for just $33! The Star Certificate (PDF) features the star coordinates, the star name and the star date. This PDF-sheet explains how you can use all features of your star gift using the unique OSR Code. In the order form you can add a personal message for the recipient, which is featured on this PDF-sheet. The official PDF-letter from OSR, confirming the registration of the star in the Online Star Register. Get access to free content @ OSR Universe. Order the Online Star Gift! After ordering it’s always possible to do a Gift Pack Upgrade from your OSR account. You’ll only pay the price difference between the Online Star Gift and OSR Gift Pack ($21/€15). 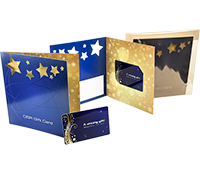 This service from OSR allows you to order a Gift Card, which the recipient can use to name their own star. You can receive the OSR Gift Card by mail or download it instantly as a PDF. Order the OSR Gift Card! Name a star now! - Which gift to choose?